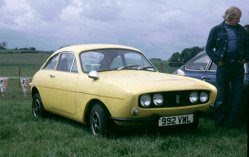 The Ogle, built from 1962 to 1963 was a Mini-based sports coupe. The firm, bereft of its founder David Ogle, went on to greater things including the Reliant Scimitar GTE and Raleigh Chopper. The similarity in parts, such as the grille, side window shapes and "buttressed" front wings is uncanny but, I suspect, coincidental. 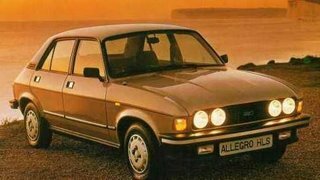 The Allegro's designer was well capable of creating original shapes, as was amply demonstrated in the 1975 Leyland Princess and Triumph TR7.